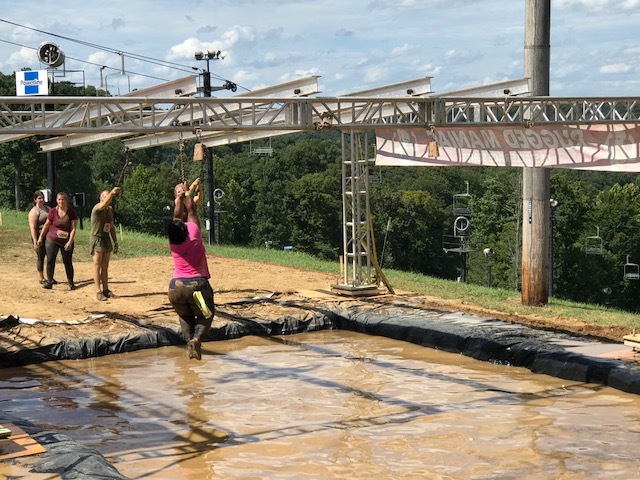 Rugged Maniac, the name alone is enough to entice anyone looking to break free from their weekday drudgery and venture into the world of obstacle courses. 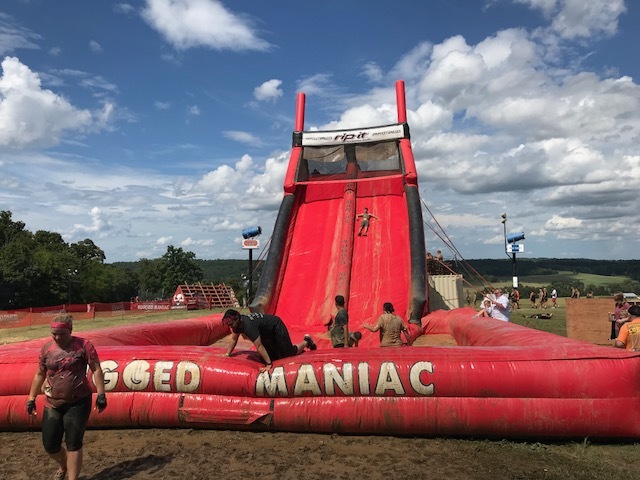 The Rugged Maniac is a series of obstacles course races offered throughout the United States and Canada. Its 5km course offers 25 obstacles and enough mud to make sure you have plenty of epic photos and stories for your co-workers come Monday Morning. 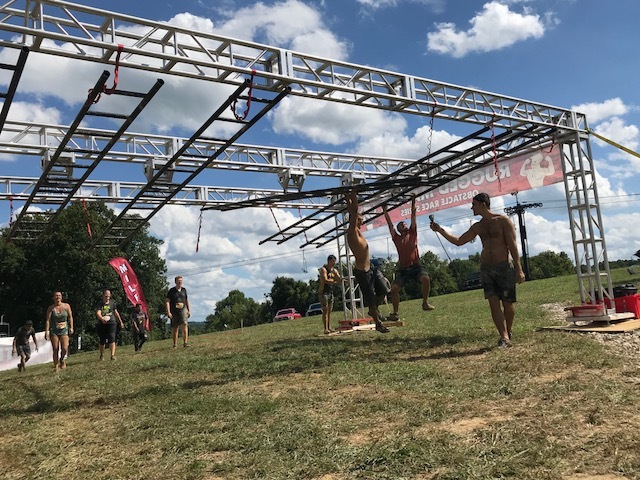 Rugged Maniac is designed for anyone to tackle, not just the every weekend obstacle course racers. The untimed race reinforces the community and camaraderie that many enjoy from larger brands like Tough Mudder. But don't let that deter you. There's still a timed wave for the competitive racers looking for that extra incentive. Located at Paoli Peaks in Southern Indiana, the course alone is tough. The constant up and down the barren ski slopes will slow you down and test your endurance beyond the 5k distance. The majority of the course was spent on the open hills, with very little time going through trails or water obstacles which opens the course up for racers to pass easily without getting stuck in a narrow line. Like many of the ski resorts who host obstacle course races over the summer, the biggest concern is coming down the hills. The slopes are filled with rocks and small ravines that can quickly twist an ankle or worse. For those who train and prepare for OCR events, the obstacles will be fun, but not very challenging. For the majority of people participating the obstacles are worthy of their entry fee. The obstacles at Rugged Maniac's are a mix of climbing, crawling, balancing, and a few that require grip. The names alone give you an idea of what to expect as you approach; The Ringer with it's swinging rings over water, Frog Hop as you cross floating docks, and Accelerator 2.0 to finish your warped wall climb and cross the finish line. The course even offers several inflatable obstacles which add to the lighthearted challenge of the entire event. 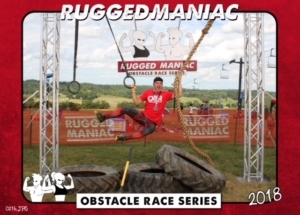 On the back of the Rugged Maniac finisher shirt it says “25 epic obstacles, 5 fun kilometers, 1 wild after party”, and I have to admit that Rugged Maniac is one of the best post-race festival areas I've seen. Every festival has vendors and the obligatory post-race free beer, but few offer plenty of seating under a large party tent. Around the eating area, you'll find corn hole and other yard games to enjoy with your friends like you would any other sunny weekend cookout. Top the whole thing off with a stage and DJ set up with constant entertainment and you're bound to want to come early and stay late. Crossing the finish line at Rugged Maniac, you'll be met with enthusiastic volunteers and staff. The finish line offered a nice variety of refueling options including bananas and sliced oranges (a nice addition I've never received anywhere else) in addition to sports drinks, water, and protein bars. Next, you'll quickly realize you get what you pay for with Rugged Maniac. While being one of the most affordable obstacle course races, you definitely won't get the best finisher gear. Going into the race I was excited to see the finisher shirt for this year and was impressed with the design. However, when I crossed I was disappointed to be handed the exact same shirt I got last year, which has printing barely legible and no artwork at all. 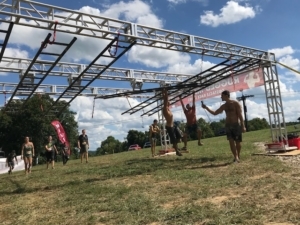 Next to the finish line is an epic set up of rings, climbing ropes, tires, and sledgehammers setting in front of the Rugged Maniac logo to pose and take photos only if you're willing to pay the $10 fee for the professional photographers to do it. “You'll never forget your first” is what the emcee told us at the starting line as about 75% of the racers in my 11 am heat raised their hand to say that this was their first obstacle course race ever. They picked a good race to get acclimated to the sport. While I enjoyed the race, I'm not sure I'll do it again. There were very few volunteers, making safety and obstacle flow a challenge. The finishing slide (Accelerator 2.0) is set up to look epic but turned out to end in an empty pool covered with about an inch of mud, making it rather painful and anticlimactic. Honestly, this is a perfect race for anyone who has never set foot on an obstacle course. Because none of the obstacles are too high and the waves are untimed, I'd consider it a step up race for my boys who are too old for the “kids” races at Spartan and Tough Mmudder (ages 10 and 12). Overall I'd rate is a 3 out of 5. Have you done an Rugged Maniac?